Are you looking for an ideal way to modernize the look and feel of your bathroom? Few bathroom remodeling efforts do as much to change your washroom space as new shower tiling arrangements do. If the tub and tile in your bathroom have begun to deteriorate or you’re simply ready for a new look, turn to Harris Flooring America for an all-new custom tile shower design in Anderson, SC. Older homes often feature bathroom designs that are ill-suited for the specific aesthetic or functional needs of the homeowner or their family. The existing tile may not match your modern décor, or the shower may lack fixtures or an ideal shelving setup needed for proper sundry storage. Instead of living with an outdated, impractical design, turn to our tile shower designer to change your bathing fixture for the better. When you turn to our dedicated team for a custom shower remodel, we’ll provide you with a broad array of options that are sure to satisfy your every need. Our expansive selection of ceramic and porcelain tiles includes a medley of desirable colors and textures. With so many different qualities to consider such as color, size, and tile design, finding the right choice for your home could be somewhat difficult. That’s why our knowledgeable specialists are always available, ready to help eager homeowners find the solution that perfectly meets their every need. Adding a ceramic or porcelain tile shower to your washroom space is a surefire way to increase the appeal and value of your home overall. These resilient options are water resistant and easily complement any interior design you have in mind. If you’re tired of the monochromatic and mundane look of your current shower tile, you are sure to be well served with a new tiling design. 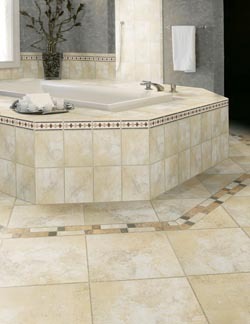 Our ceramic tile is easily cut into a variety of shapes and sizes. This allows our tile shower designer to create original mosaics that offer a one-of-a-kind look. In contrast, our porcelain tile won’t crack or fade, and its ease of maintenance makes it a highly desirable choice for your new bathroom. When you hire our shower designer, we always take the time to listen to your aspirations and desires. We have worked closely on projects of all shapes and sizes. Our team understands which products to use to help you create a unique space you’ll love for years to come. Whether we’re creating a ceramic tile shower or something else entirely, you rest assured you’ll receive a washroom transformation that you can be proud of. Contact us to learn more about our vast selection of shower tiles. We proudly offer our services to customers in Anderson, Seneca, Greenville, Clemson, and Easley, South Carolina as well as the surrounding areas.